1.It mainly adopts PLC programming control system. It consists of 2 welding transformers, as well as electrodes and series lines. It adopts roller type straightening design. The bending degree of steel bars is within the controllable range, which is conducive to the increase of the falling speed. 2.In the aspect of storage, the horizontal line numerical control hopper is used, the cylinder drives the pay-distribution disc to realize continuous and stable dropping, and the welding has no waiting. The power requirement of the whole machine is designed according to the welding strength of welding wire diameter of 3-8mm, and one compression and sub-control welding. It also reflects the concept of energy saving and emission reduction. 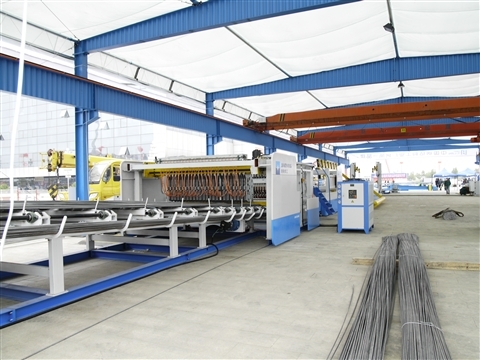 The automatic concrete wire mesh welding machine consists of five parts: the horizontal rib automatic storage mechanism, the longitudinal rib straightening wire feeding mechanism, the welding main part, the mesh automatic shearing net (mesh automatic coiling net) mechanism, and the reciprocating netting mechanism. The longitudinal longitudinal reinforcement of the steel mesh is cut by the disc, straightened up and down and straightened to the left and right, and clamped tightly by the clamp. The stepper motor drives the clamp to each step of the distance of the gold. Move, the horizontal reinforcement is automatically fed by the bracket and welded by the electric welder. Traveling and welding alternate. Welding is not allowed when walking, and it is not allowed to travel when welding. In the standard mesh welding, in order to not cause erroneous actions, each block of the program is executed, it will be invalid until the next mesh is welded.